I first spoke to Adrian in 1980 when he was a member of the Scottish Junior team for the Bell’s International at Meadowbank. I was the admin officer (ie I gave out the tracksuits and collected them back in, gave the athletes wee Scottish badges to swap, etc) and Adrian was one of the two 1500metre runners, the other being Stewart MacPherson, also of Springburn Harriers. I had known of him and seen him in action for several years before that. I had just been appointed Scottish Secretary of the British Milers’ Club and Adrian was a member and eligible for race invitations so we soon became friends. In addition I had been training at Springburn and watched him training under the guidance of Eddie Sinclair. Eddie’s top athlete was Graham Williamson and Adrian used to train with him and even went altitude training with him to New Mexico. But I’m getting ahead of myself, let’s go back to the beginning. Adrian (Date of Birth:28/11/62) was one of a group of young Springburn Harriers who won everything there was to win in the way of championships and open races and who won the Western District Young Athletes 3 x 2 Mile Relay Championship from the year it was inaugurated (1976) to 1980 before Clydesdale Harriers won it in 1981. They won the National YA Relay in 1977. They won team and individual titles at Junior Boy, Senior Boy and Youth levels with many staying on to become good Seniors in the club. The coach at the time was Eddie Sinclair – a former Scottish International cross-country runner – who worked the boys hard but sensibly. Before Eddie got involved, the Under 17 age group used to start their races hard, ease up for the middle third and then pick up the pace at the end – the Springburn technique was to run hard all the way with no ‘sag’ in the middle. The runners who came through like Graham Williamson, Graham Crawford, Dunky Middleton and Eddie Knox were all very good. Other names well-known at the time were those of Freddie Farrell, George Jarvie, Davie Tees, Nickie Souter, the Beaney brothers, the Picken brothers, Stewart MacPherson, Stephen Begen and many, many more. Adrian, when he joined the club, was becoming part of a rolling success story. He first appears on the scene in 1977 when as a Boy he started the year with thirteenth place in the National Cross Country Championships with the Springburn team second. In summer he won the Scottish Schools 1500 metres in 4:22.1 and in the same season he was third in the SAAA (4:26.1) and West District (4:39.1). He appeared in the Boys Rankings for the 800m where he was twelfth with 2:09.5 and in the 1500 where his Scottish Schools winning time ranked him fourth. He started the next year with fourth place in the Senior Boys Cross-Country Championship and led the club team to a comfortable victory over Edinburgh Southern in the team race. In summer 1978, in the Youth age group and racing boys up to two years older he was second in the Schools in 4:05.5 and third in the SAAA 3000m Championship with 8:48.2. These times ranked him seventh in the 1500m and third in the 3000m. In 1979 he won the SAAA Youths 1500 metres in 4:02.2 plus the 3000 metres championship with a time of 8:39.0. He then went into a good winter season in which he won the Western District Youths (U17) Cross-Country Championship with Springburn winning the team title and then the following year when he won the Junior Championship. In 1980, at the end of the Cross Country season after finishing second in the National Championship, he was selected for the Scottish Junior Cross-Country team for the international championships when he was really only sixteen years old! Better, the race was in Paris and he was the first Scot to finish! Next year (1981) was not as successful and he could only finish twentieth. On the track in 1981 and 1982 he had a bad time. He had been at altitude training in Boulder, Colorado, with Graham Williamson and on his return did not run well at all, and there were injuries too. As he was a BMC member I kept inviting him into the races we were putting on and he came along and did his best. My reasoning was that the ability that had served him so well in the past had not gone away and that if he was prepared to run in these races and finish down the field, then his motivation must still be there. He appeared in no ranking lists in either year. He didn’t re-appear in the cross-country championships either until 1985 when he was twenty third. Being a good clubman he ran in the Edinburgh to Glasgow all through the 80’s: in 1980 (seventh stage), 1981 (eighth stage), 1982 (fourth stage), 1984 (first on the first stage), 1985 (13th to 8th on the second stage), 1987 (9th to 5th on the second stage). Springburn was not in the race in 1989. His fitness pattern shown above was replicated on the track with the 1984 – 1990 period being really outstanding. Having been brought through the ranks by coach Eddie Sinclair, Adrian was troubled with a series of knee injuries. On his return he started training with George Martin, a former professional athlete who was coaching the women and girls at Huntershill, and came back to his best. 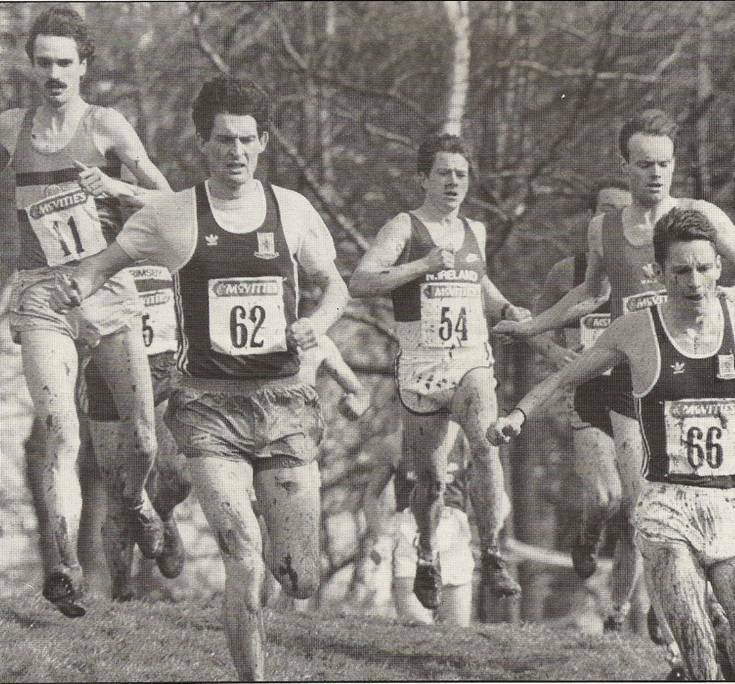 Starting 1985 with an excellent twenty third in the National Cross Country Championships, that summer he had a best 800m of 1:52.1 (eleventh in Scotland), 1500m of 3:41.9 (second in Scotland, twenty second in GB), and Mile of 3:58.28 (first in Scotland, sixteenth in GB). This was his first time inside the magic four minutes for the Mile and put him in a select group of six runners who had done so inside Scotland and no one else did it before his death in 2007. 1985 was a significant year – the Commonwealth Games were being held in Scotland in 1986 and there was opposition from his old training partner and friend Graham Williamson, Alistair Currie, John Robson, Tom Hanlon and the usual Anglos who ‘discover’ a Scottish connection in Games year! He started 1986 in fine style with a good fifth place in the National Cross Country Championship and selection for the World Championships where he was one of the team’s counting runners. In the course of the 1985/86 period he had broken the four minute barrier twice (3:59.45 on 23rd July 1985 and 3:58.28 on 13th July 1986), he won the SAAA Championships in 3:43 in 1986 and it was the fastest winning time since 1978 and only one winner was faster in the twenty years up to his death. With the Commonwealth Games in Scotland he was clearly hoping for a call up to the team but when this did not materialise, he was very angry. He had been told on a trip with a Scottish team to the Small Countries International (the small countries were Catalonia, Cyprus, Ireland, Wales and a few others) by John Brown, the team manager and one of the selectors, that he would be included if he won the SAAA Championships. 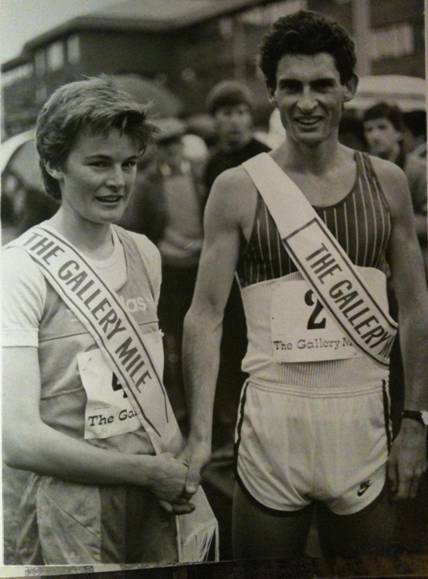 Doug Gillon reported on the incident in the August 1986 ‘Scotland’s Runner’ as follows: “Disappointment at his omission from the Games, prompted Springburn’s Adrian Callan to return the 1500 metres trophy which he won at the Scottish National Championships with a winning time of 3:43.00. Callan felt he was misled by a communications breakdown, alleging that the Games team manager, John Brown, had denied him a race in Innsbruck – the same race which could have earned Graham Williamson a late place at 1500 metres. Brown denies making such statement to the young Springburn accountant. Callan described the trophy as ‘worthless’ and demonstrated his undoubted talent with a front-running 3:41.9 in Shettleston’s open graded meeting at Crown Point. Again however it was tantalisingly close to the 3:40.5 laid down back in January 1985.” I knew Adrian quite well and he was quite clear in saying that he had been told that in view of the sub-four and form since then that he only had to win the SAAA title to be sure of inclusion. When he was not included he phoned me because I was Scottish Staff Coach for 5000 and 10000 metres and asked if I would take the trophy back on behalf of the SAAA. I had my own battles to fight at that time and it was more appropriate that it be returned to one of the administrators than to a coach. I suggested that since he lived in Bishopbriggs, he take it to the President of the SAAA, Bob Peel, who also lived in Bishopbriggs. And that is what he did. There were many people who felt aggrieved at non-selection at that time but Adrian was entirely justified in the stand he took. At the end of 1986 he went with fellow Springburn Harrier Robert Chalmers on a sports scholarship to Nevada University. As Robert says in an article in ‘Scotland’s Runner’ for January 1987, “We spent a very hectic late July and early August getting things organised and only received our student immigration forms two days before we left. We flew out to Reno, Nevada, on August 24th and arrived 38 hours later (including a night stop in San Francisco).” It was an interesting experience but they returned after only six weeks and their experiences and opinions are in the article which can be reached at www.salroadrunningandcrosscountrymedalists.co.uk The picture below is from that article. Had the table gone from 1980 to 1995 the passage from top left (800/1500) to bottom right (5000) would have been more easily seen. He also had excellent times recorded for 10 Miles on the road as well as for the many now popular 10K races. His personal best for 10000 was done in the year 2000. He still had work to do for Springburn even if it was not on the track. In 1988 he helped them to win the West District Cross Country title and then he was in the team which won it again in 1993 In 1988 Springburn won the Scottish Six-Stage Road Relay Championships. Made up of three short stages (c5000m) and three longer ones (c10000m), the team of Alex McIndoe, David Donnet, Graham Crawford, Adrian, Jim Cooper and George Braidwood won by only 35 seconds from Edinburgh AC. Graham and Adrian recorded the fastest time on their stages. He returned to cross-country running in 1989 when he was ninth finisher (but only second Springburn man behind Paul Evans) and in 1990 he was fourteenth (three places behind George Braidwood.). The change of clubs certainly happened about that time Shettleston were second in 1994 and Adrian’s last National Cross Country Championship in Springburn colours was in February1994 when he finished fifth. He was certainly turning into a formidable cross country runner for all the fact that he was a big and strong man, not at all like the typical cross-country whizz. Had Scotland still been in the International Championship in her own right then he would surely have collected many more representative honours. His record in the National Cross Country Championship for Shettleston was – 1995 sixth, 1996 eleventh, 1997 seventh, 1998 nineteenth, 2000 nineteenth, 2001 thirty eighth, 2002 twenty fifth and 2003 twentieth. Whatever the club he supported it whole-heartedly. If we look at team medals won while he was a member of Shettleston Harriers, they are quite breathtaking. The major medals are marked on the table below – the positions marked are the medal winning teams of which Adrian was a part. That’s 33 team medals and not counting such as County Relays, County Championships or non-championship events such as the McAndrew or Allan Scally Relays! On an individual level, Adrian seemed to revel in a situation where he was not striving for the very top any more – he was doing what he wanted to do – run and enjoy it. The team aspect and the lack of individual pressure only made him a better runner. He won the District Relays more than once, he won the set the fastest time in the Six Stage several times and he even won the Shettleston club championship three times – 1994/95, 1995/96 and 2002/03. He liked testing himself against the best – he had in the eighties and early nineties raced in the British League for Wolverhampton and Bilston for instance, and as a member of the Shettleston team he raced in the AAA 12 Stage Relay in 1995 and in 1996. His time as a member of Shettleston Harriers lasted for over ten years and had many remarkable facets. He had run some very good races on the track over 3000 metres with Shettleston’s John MacKay in the summer of 1994 with times being 8:05.77 for Adrian and 8:06.60 for John in race at Meadowbank. He joined in a couple of their sessions and Bill Scally had actually been coaching Adrian for a couple of months before he switched clubs. Being the loyal clubman that he was, he thought long and hard about the issue and had a number of conversations with Bill about moving. There was a good bunch of runners at Shettleston at that time – Billy Coyle, Graham Wight, Tony Coyne, Andy Little, John MacKay and others – and for a man who had enjoyed so many years with a good group around him at Springburn, that must surely have been an attraction for him. Shettleston had lost something at that time just after Nat Muir’s retirement and Adrian with his pedigree and presence – he really was impressive: tall and physically strong he always looked the part. Some runners like to train on their own but Adrian liked company and as a member of Shettleston Harriers he took part ineir regular long Sunday run which moved from venue to venue as the weeks went by but one of the regular features was Adrian taking everyone back to his Mum’s house for breakfast. 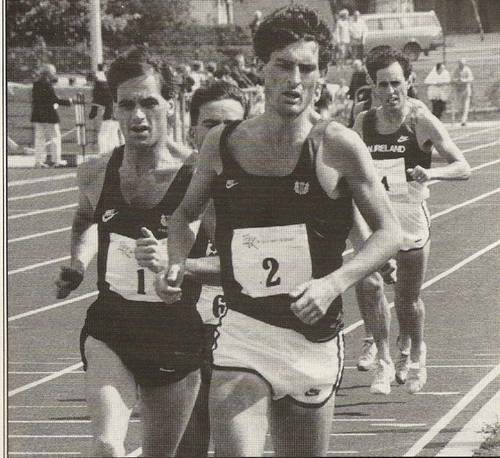 He continued running on the track tough and his best run is reported to have been over 5000m in 1995 when he finished second in the Scottish Championships to Dermot Donnelly who won in 14:16.40 to Adrian’s 14:18.82. Chris Robison, International cross-country and track runner was third. In 1998 he was second again – this time to Glen Stewart before returning to Glasgow for his Stag Night! While with the club his best time for 1500m was 3:51.4 in the Lanarkshire County Championships on 23rd August 1997. When I asked John MacKay about Adrian’s best runs for the club, he checked with other club members and came up with two outstanding performances. First when he ran 15:00 for the short stage of the six-stage relay and broke the record when the team finished second in 1999. He was 37 at the time, an age when most are looking forward to starting a career as a veteran. Second was in the Allan Scally Relay Race which is organised annually by Shettleston Harriers. Bill Scally was organising the club team which won in a new record time with all four runners ( Billy Coyle (22:15), John MacKay (22:30), Adrian (22:18) and Graham Wight (22:15)) inside 23 minutes – a quite phenomenal performance – there have been years when there were not four runners in the entire race inside 23 minutes. John also reminded me that Adrian’s range was quite fantastic – his 66:01 for the half-marathon during the European clubs championship in Strasbourg being particularly noteworthy. The course was of three laps with a mile long climb in each and many a top class runner was left in his wake that day. There are so many outstanding performances from him at about this time – eg. ninth and part of the four man Shettleston team that won the BAF 10km team championship for the only Scottish win ever in this event. He won medals as a 15 year old, and also as a veteran – second in the vets National in 2003. The other major event in his life while at Shettleston of course was that he met his wife, Lara Halliday, after being introduced by John and Elaine MacKay. Lara was the sister of Darren Halliday who ran for Shettleston. after they won the Gallery Mile Races at Kirkintilloch. He was friendly with Ross Welsh down in Annan (in the Scottish Borders) and at that time Steve Ovett had bought himself a castle in the area. Steve Binns had also come to the area from England and they would often get together when Adrian visited. It was pointed out that it was hard to believe just how slow Ovett’s easy runs were and also pointed out that Adrian seemed to share this philosophy. The ‘craic’ was said to have been good and Adrian and Ovett shared the same dry sense of humour. There wre times nearer home when Adrian would do a hard session in the morning and then walk top the top of Ben Lomond in the afternoon/early evening. Or the long Sunday runs where Adrian and training mates would often end up at the All-You-Can-Eat Curry House and spend the entire afternoon there.